German Light Products is proud to announce the release of the new impression Laser. GLP impression Laser is a pure diode RGB moving head laser projector. It inspires all those who want to be one step ahead. 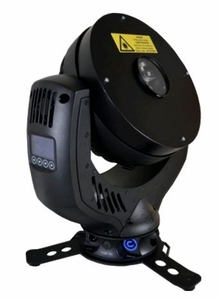 Small, handy, light - thus the moving head laser show system can quickly be mounted on each stage. It blends inconspicuously, but quite certainly striking, in the concept of the show. Each laser show, whether beam show or laser graphics, is positioned precisely by the Moving Head on any�projection screen. The Moving Head is controlled conveniently via DMX, the laser output via ILDA. Amazing and creative laser shows allows the professional and world famous laser show software�LPS-RealTIME Pro. The GLP impression Laser is available with 3W and 6W RGB.